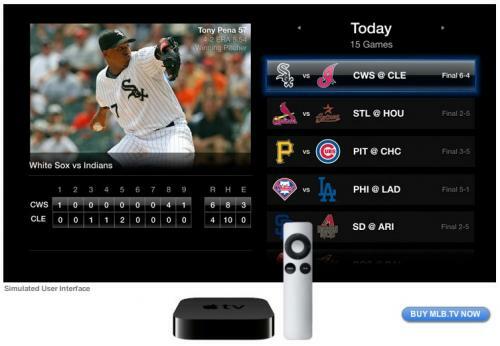 As noted by Business Insider, Major League Baseball has announced that live and archived streams of baseball games are now available through the Apple TV. The new services are available through a software update released today as part of the iOS 4.3 rollout. Enjoy select Spring Training games and a full slate of regular season games on Apple TV. The service requires a subscription to MLB.tv, which is available in packages costing $19.99 per month ($99.99 per year) or $24.99 per month ($119.99 per year). The update also adds access to the National Basketball Association's League Pass feature, providing free access to scores and stats while also offering the option to upgrade to receive live and archived video feeds of games. Video pricing is set at $64.95 for access to watching games for up to seven teams througout the season, or $99.95 for access to all teams' games. Other improvements include Dolby 5.1 sound for Netflix streaming, a redesigned onscreen keyboard, and new photo slideshow transition options.